Dang, I am really behind on posting. I read a quote recently that suggested one should meditate for 20 minutes a day, and if too busy for that, then meditate for an hour a day. It’s a really good point. Pausing is in order. For horsepeople, perhaps think of meditation as a half-halt in the forward motion of life, a momentary slowing to regroup. Get your feet under you, collect, and then continue in a more organized, empowered way. I have been just too busy. Mostly with work, and then with trying to get caught up from having been too busy with work. Things are slowing down now, and I’ve got a little breathing room. More important, thanks to support from my darling hubby, and a willingness to be creative with working arrangements on the part of my employer, I am on course for creating a more balanced life in the long term. Getting myself into a better daily rhythm is important. Sitting for hours on end is terrible for anyone’s health, and particularly injurious to mine, I think. It really aggravates my peripheral neuropathy, so by the end of 8 or 9 hours everything hurts. It’s a miserable experience, on all levels. Being able to be active for more of the day is something I’m moving toward at every opportunity. And getting enough sleep. That one’s a challenge. My goal is to have time and flexibility to pursue writing more consistently, to focus more deeply on my Aikido training, and get a hundred (+/-) projects done, or heck, started – house maintenance, yard improvements, a vegetable garden, that kind of thing. Oh, and simplifying, focusing, and decluttering. I have a lot of getting rid of things to do, to make space for whatever’s next. Meanwhile, here’s a litte catching up since my last post, at the “O Sensei Revisited” retreat (May 18-20, 2012). It was a wonderful little camp in Occidental, California, just north of the Bay Area, in the woods. I had posted bits and pieces about the event, until the WiFi went out at the Lodge. And then I drove home. And then I went to work the next morning. And didn’t come up for air until now. We had an amazingly good time. The people were wonderful, the food was good, the facility was recently built, and well designed, and the surroundings were beautiful. Twelve of us went from Aikido of San Diego. It was a great dojo bonding experience. Someday, we will bring Oya the tea she deserves. The workshop itself was brilliant. 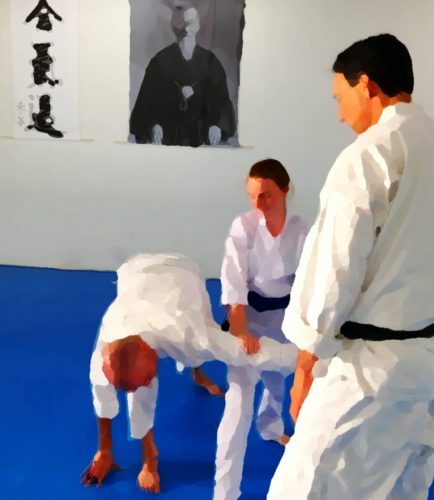 It’ll get its own post, but it had a fairly narrow subject, which we explored in some depth, lead by Nadeau Shihan, with parts presented by several instructors, who each approached the work in their own way. The trip home was a grand adventure, also deserving of its own post. It included great company on the road, visits with four friends on the way south, a solar eclipse, sitting in a river, incredible coastal views, elephant seals, horses, lots of coffee, and hours of delightful conversation. Since returning, I have been working and training, mostly. I am very fortunate to be mentoring a friend for his upcoming 3rd kyu exam, which means extra training for me, paying closer attention to details than I often do, and enlisting the help of our generous yudansha to help us through the fuzzy parts. It’s also been a month or so of milestones, transitions, and beginnings happening around me. Again, subjects for another post, but for the moment I’ll say it’s been a time to look at where I am, where I’m going, and what it will take to get there. Meanwhile, it’s time to feed the donkeys, cats, skunks, ‘possums, and raccoon, and then get to bed.